It's ANYTHING GOES time on the Simon Says Stamp Wednesday Challenge Blog! The Design Team is playing with Penny Black products this week. I absolutely HAD to get this stamp when I saw it!!! After all, I DO drive one! *insert winky face here* You don't have to use Penny Black to play along, bug if you have some, we'd love to see what you do with them! This is the Penny Black Miniful Hedgehog stamp. You guys. It's a Mini Cooper. And a hedgehog. And a couple of other cute animals, to boot. For REALS, it is fabulous. For reals, though. For reals. I used my Tombow markers and a waterbrush to watercolor the image. This was a new method for me, but it was a fun one to try and I like how bold the colors are! The Sun is from the Simon Says Stamp My Sunshine stamp set and the sentiment is borrowed from the MFT Tickled Pink stamp set. Don't be afraid to mix and match those stamp sets! Even if they are from different brands! I added the 'chrome' with a silver pen and then used Glossy Accents to create a glass look over the windows once the watercolor had dried. Because this is all on watercolor paper, it stood up very well to all these treatments! Love that! You can find my complete supply list below. Now it is YOUR turn! Create something fabulous (just make sure it is NEW, no backlinking is allowed), and link it up to the Simon Says Stamp Wednesday Challenge blog for your chance to win a $50 Gift Voucher to the Simon Says Stamp Store! Yup! It's THAT easy! We can't WAIT to see you there! The links you find in this post are affiliate links. As always, your support is much appreciated! This is so cute! Did you color with the Tombow and then watercolor over it or scribble on a mat and pick up the color with a water brush? Love the effect, and I love my tombow markers always looking for new ways to use them : ). Awwww this is sooooo cute ! Oh my goodness, how cute is this!! Love how you colored that car!! So cute! I love how you hung the car out over the edge!! 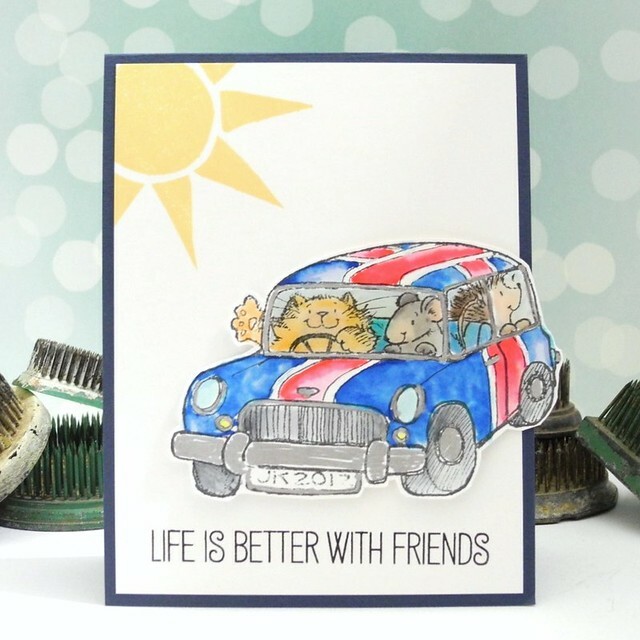 An adorable card Jennifer, super sentiment for the adorable cute Mini full of friends.......I love the off edge!! Adorable card, Jennifer! I love how you had the car come off the card...and the glossy accent windows? Brilliant! This is so cute! 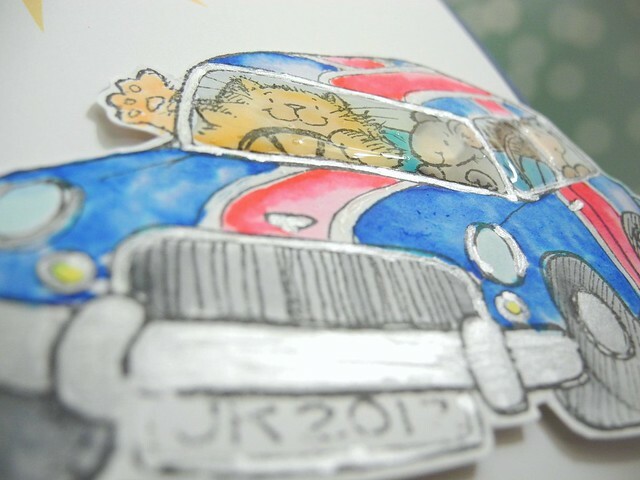 I love the little critters, and how you have the car going over the edge of the card! This card is so cute! I love all of the little details you added to the super cute stamped image! I agree with your sentiment. Love that car with critters inside. Adorable card, Jen! Love the watercolor feel in this! Darling card, Jen! That shiny window is awesome! I've so missed popping in to see what you've been working on. I knew I would see something extremely cute and you sure didn't disappoint Jen. LOVE this!!!! Life truly is better with friends. Love your fabulous mini card, its brilliant. Love it! Such an adorable image and the watercolor look adds extra softness to these cutie pie animals and their sweet ride! Thanks so much for sharing!!! Adorable card Jennifer! Such a sweet image! I love how it is coming off the edge of the card! Awww - this is so sunshiney and sweet! I just adore it! Life truly is better with friends, isn't it? Thanks for being an amazing cardmaker and helping my creative mind whir whenever I stop by. You rock!